America’s most bizarre crime! Brutal beyond description! One Night Only! The film which is about to show is an account of the tragedy which befell a group of five youths. It is all the more tragic in that they were young. But, had they lived very very long lives, they could not have expected nor would they have wished to see as much of the mad and macabre as they were to see that day. For them, an idyllic summer afternoon drive became a nightmare. 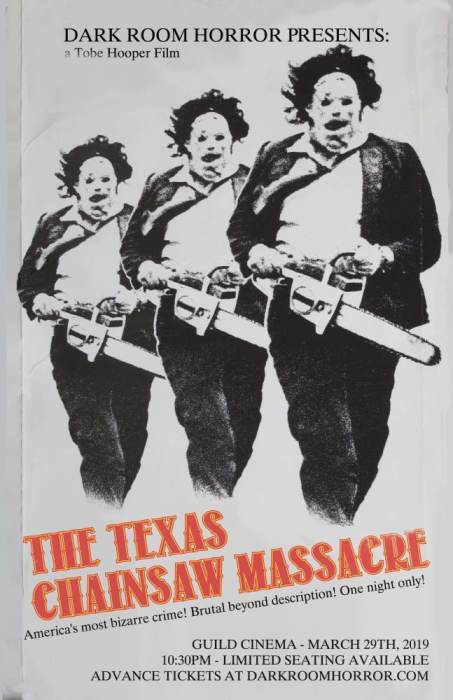 The events of that day were to lead to the discovery of one of the most bizarre crimes in the annals of American history… Dark Room Horror Presents: The Texas Chainsaw Massacre.